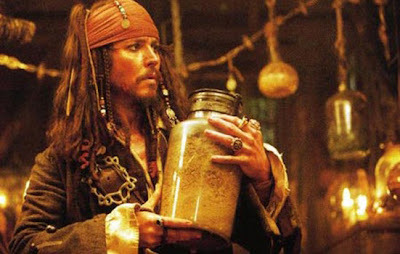 Disneyland workers were recently forced to close the "Pirates of the Caribbean" attraction after a ride security camera caught a woman apparently dumping human remains, in what may be a growing trend. Workers at the Anaheim theme park spotted the woman sprinkling an unidentified substance into the water on the "Pirates" ride. Anaheim police were notified of the incident. ...They said it started at the Haunted Mansion, but now the "Pirates of the Caribbean" ride is growing in popularity. Al Lutz, who runs Miceage.com, told KABC that it is not unusual for people to scatter a loved one's remains at the happiest place on earth. I also very much enjoy this remix of "Jar of Dirt"